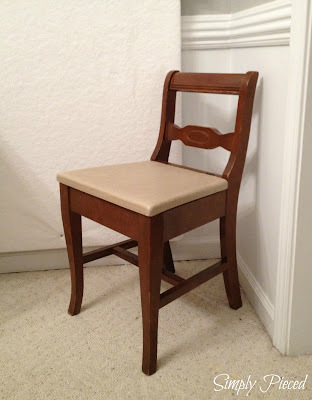 I have been busy turning a formal dining room into a sewing room over the past month. I received a small bonus at work and was able to put that money to good use to help with the transformation. Last weekend was the big push to get it functional, but not complete. My formal dining room was the one room in the house that was NEVER used. 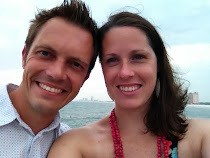 With two introverts married to each other, hosting dinner parties was never on our to do list. With two toddlers in the house, getting home from work, eating dinner and getting kids to bed is about all I can accomplish most nights. Most of my sewing is done on the weekends and late at night if I'm in crunch mode. Without further adieu, here is my space. I promise that it's very rarely this clean. I like to sew sitting on this stool. It's got wheels and a padded cushion. It also gives me a bit more freedom than a regular chair. The side of my sewing machine houses my iPad and a mug full of things I need within reach (small scissors, fabric marker, my Kwik Klip, magnetic wand, etc.). My iPad is usually on Netflix or Pandora while I'm sewing. I'm currently working my way through the entire series of The Wonder Years. My project baskets. I keep everything I need for one quilt in a basket and it's always at hand right next to the sewing machine. This helps keep me organized. These prints were a splurge and I love them! I found them at the Keep Calm Shop on Etsy. I'm a bit infatuated with all things British and they were perfect for this space. Here's my work table (aka formal dining table). 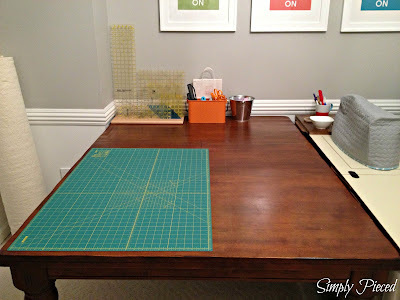 This is where I do all my cutting and hand work. I've got my rotary templates there and a utensil carrier holding my scissors, rotary cutters, basting pins, wonder clips and painter's tape. My roll of batting is also in the corner and ready when I need it. These plastic drawers hold my scraps. I had this handy storage unit in the back of my closet holding useless stuff, so I rearranged a few things and now it lives here and is perfect for storing all my scraps. Prints in the top drawer, solids in the middle, and 2 1/2 in squares in the bottom. I hope to start cutting more of those squares soon so that the top drawer isn't as full. Here's my new design wall! I got this up and on the wall this past weekend. I have this weird layout with 3/4 walls dividing this space from the living room. I was able to use some 1x2 boards to attach to the back of the insulated foam boards to hang from the top molding of the wall. It's secured in place with Velcro at the top and is pretty sturdy. Considering one of those foam boards weighs about 2 lbs, I'm not too worried about it coming down. I'm pretty happy with the results and this definitely beats a hanging plastic table cloth any day. 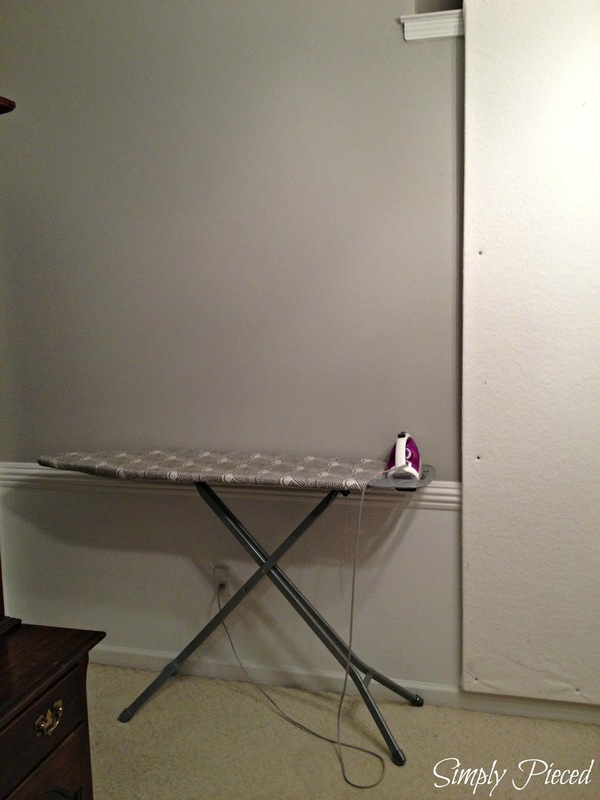 Here's my ironing board. It's up 24/7 and ready to be used at any moment. The table in front of the design wall is a fold-up table that I can use when I'm quilting a quilt to help hold all the weight of the fabrics while I'm pushing it through the sewing machine. It also works as a nice table if my kids want to come color or work on a puzzle while I'm sewing on the weekend. 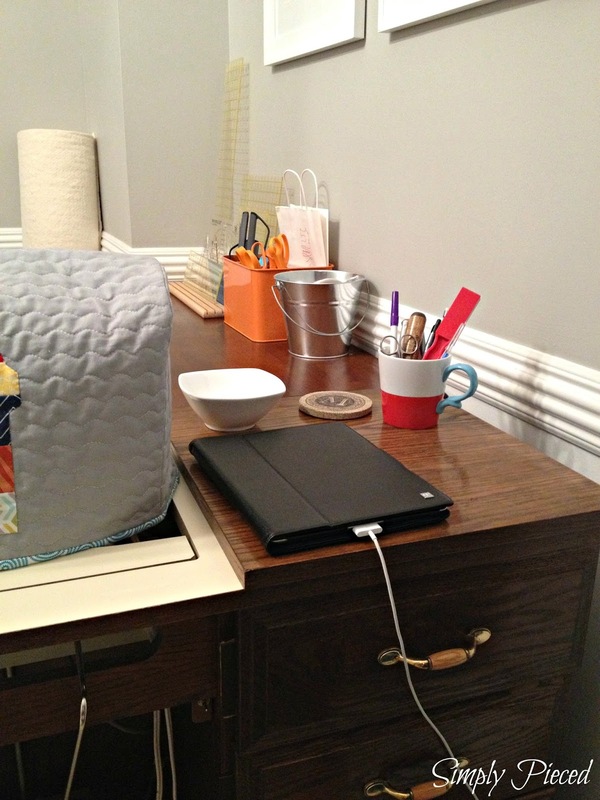 It keeps mommy more accessible and the kids happier. This is my grandmother's old sewing chair. I'm going to paint it and recover the seat at some point. I just haven't decided on the paint color or fabric choice. I have lots of room to move around and plenty of storage space to meet my needs. I have a large design wall and I can't wait to put it to good use. I have a place where my children can come and join me while I'm sewing without getting in the way. I have no natural light. All the windows are in the living room/kitchen or by the front door. Lots of dark woods. I like dark woods, but prefer lighter tones in a creative space, especially since I have no natural light. One day I may attempt to fix this, but it will just have to do for now. 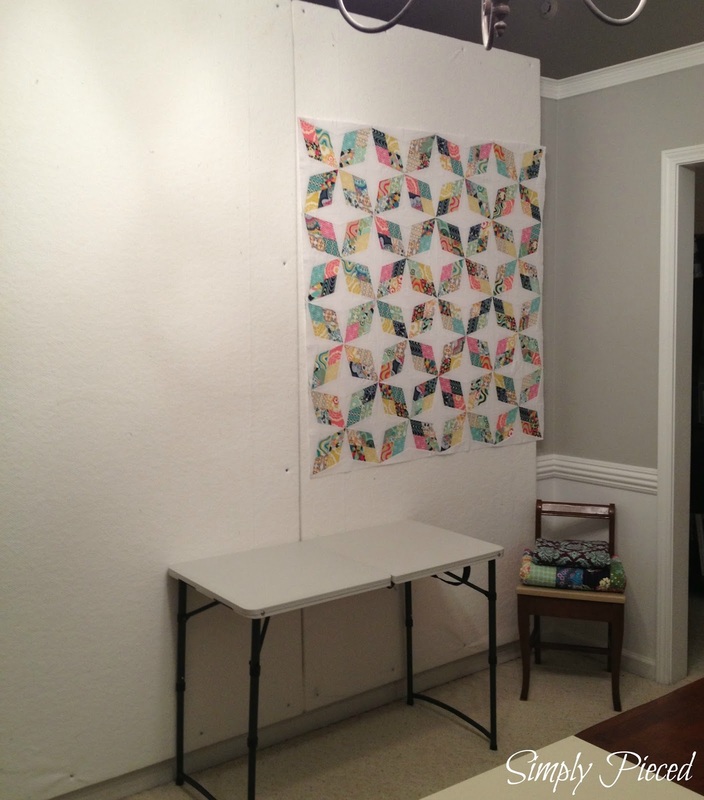 Quilted wall hangings to brighten up the space. A quilt rack my father is building for me to display WIPs and finished quilts. A small bookcase to hold sewing/quilting books. Well, what do you think? 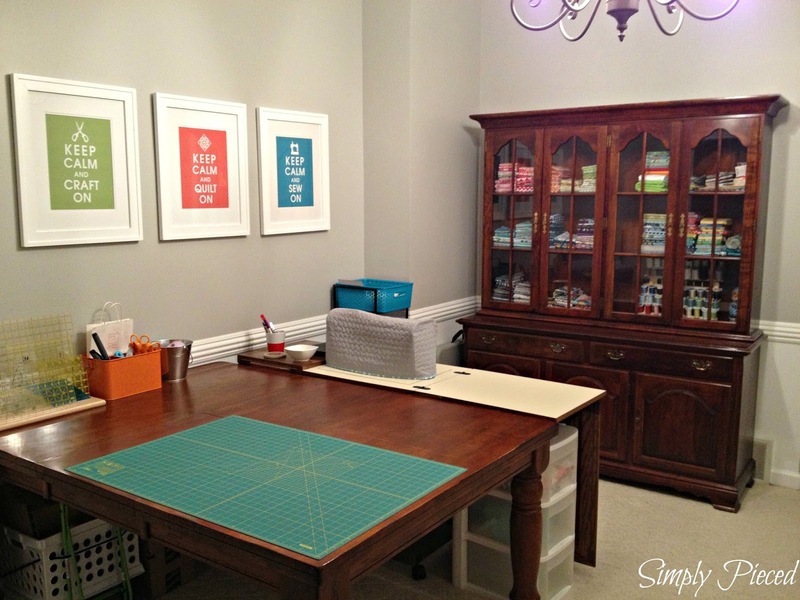 Would this sewing room work for you? It looks great, Janet! I especially love the fabric in the china cabinet. I'm stuck sharing sewing space with our intact-for-now dining room, and also struggle with having so much dark wood in my creative space. Ah well, some day, right? 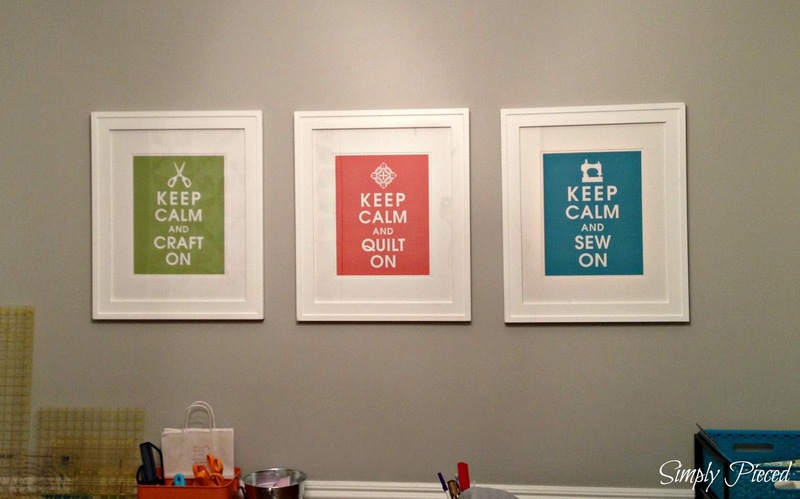 Oh I wish they had a Keep Calm and Get The Seam Ripper print! That would be so perfect in my new space. I love the big design wall--I'm half way finished with mine and can't wait (it will be 72 x 96). That china hutch is beautiful! At our old house we had a formal dining room and only used it when there were more than 5 people eating (which was only a few times a year!). To do in my new sewing room: cover and hang design wall, make/swap and put up minis, more lighting for night time work, light tube for more day light/natural light, better kid-play area (currently it's the middle of the room and I hate walking over the mess every time I do anything), and replace the dark brown outlets and covers with white ones. 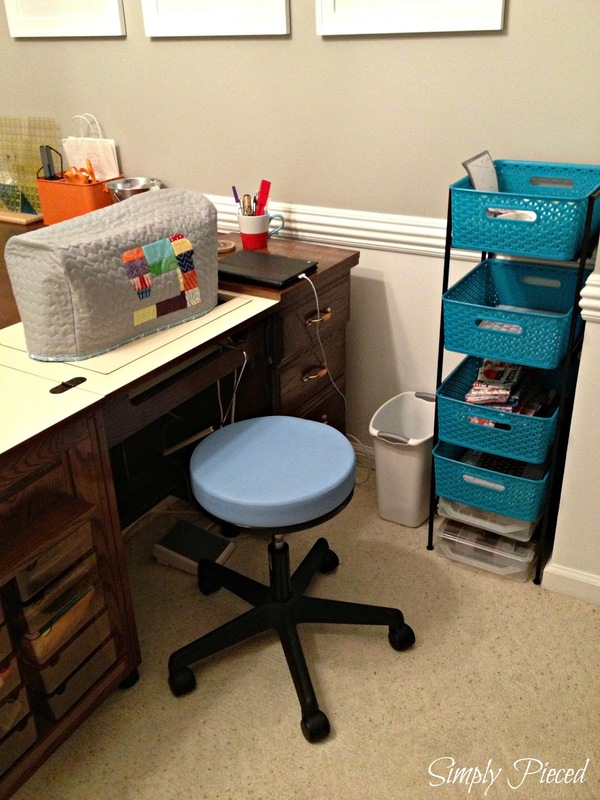 Your sewing room looks fantastic! What a creative way to turn your dining room into usable space! Love your china cabinet full of colorful fabrics - so pretty! Enjoy! Oh, Janet, this is fabulous! 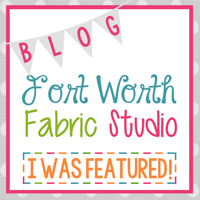 Are you linking up to Em at Sewing by Moonlight's Sewing Room Clean Up? I LOVE those Keep Calm prints. Looooking good! 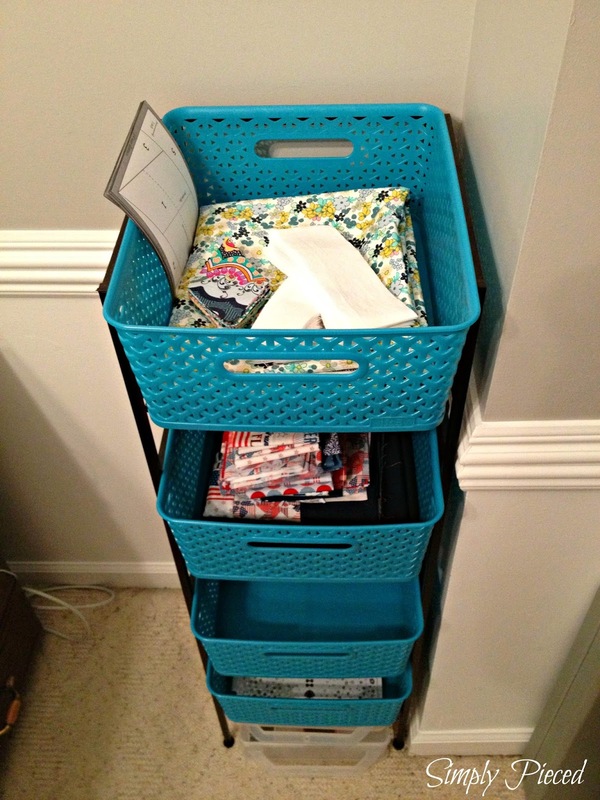 I love all that space and you project organization basket is brilliant! This looks great! I love how you have the project baskets close by. It's got me spinning ideas around in my head about how to get some project baskets into my space. I already have the baskets, just need to find a place to put them. And that design wall is amazing! So much space, and yes, as someone currently using a plastic tablecloth, so much better than a table cloth! I'd say you did good! It is roomy and neat....all good things to have. Creating in that space would be easy! Looks wonderful! What a great space for you work. I love the fabric in the hutch behind your sewing table. Easy access while you are working, and easy to see them all even when you don't need them. Good luck in your quest to add more color to the walls; that will be a fun project. I like it. It's so big compared to mine! I also love the turquiose project baskets. Mine are smaller bins so by the time I add in all the fabric, they overflow quite a bit. It also won't seem so dark once you have time to paint some of the larger pieces, like the china cabinet. I also love your design wall. Mine are moveable boards that are always in the way. Your room is gorgeous! Very nice! love it, Janet! It looks like you've made great use of that space. That's beautiful! so much space and love the keep calm posters! What a nice place to sew and quilt! Love your keep calm posters. I have some problems to stay calm myself when my sewing machine do not want to do what it has to do! Looks amazing! 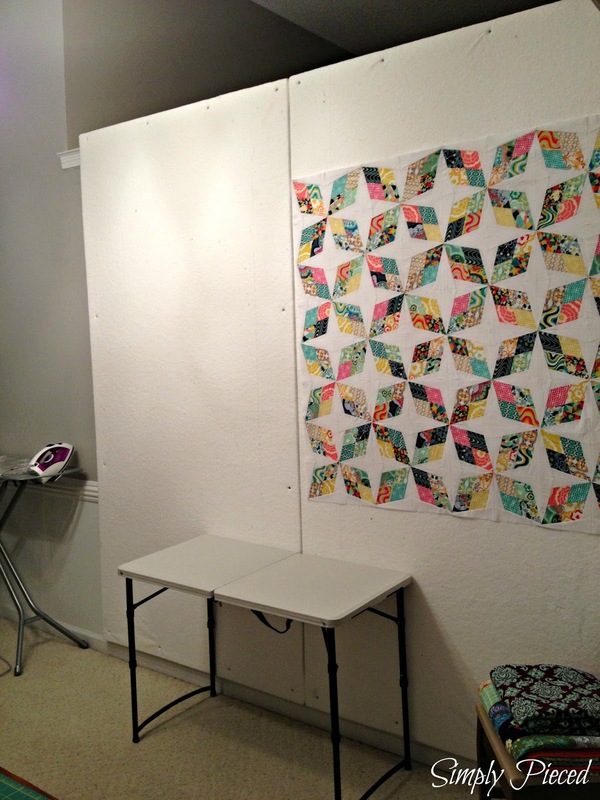 I know how you feel with no natural light, my quilting area is in our basement. Book cases are a must have, and I can't wait to see how the quilt stand turns out. Totally jealous of your design wall! Strong work! Your sewing space looks like a sweet place to create! It looks awesome. I just love your teal bins with the black holder. Where did you get that? I feel you on the no natural light. My basement doesn't have any either! This is beautiful! Paint the chair either the color of your baskets or one of your "Keep Calm" posters. Love it! Yay, You!!!! 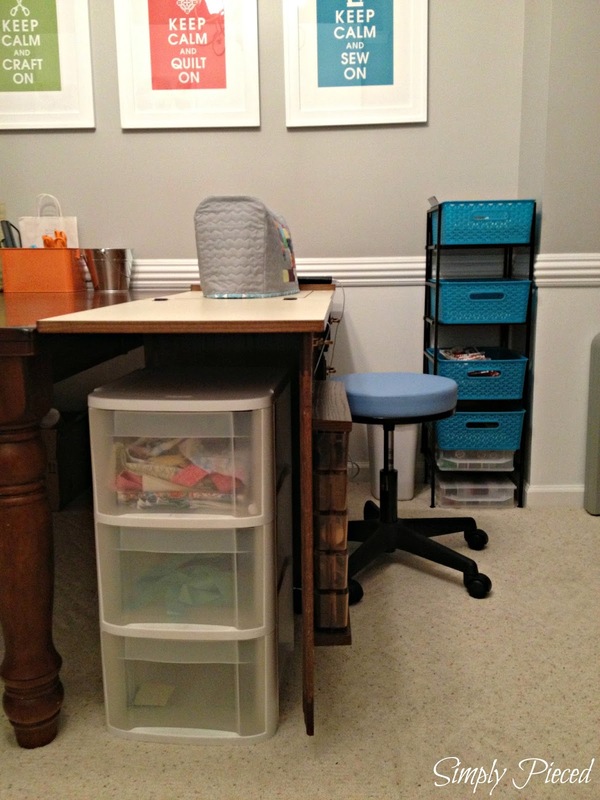 I like the way you did your sewing area. 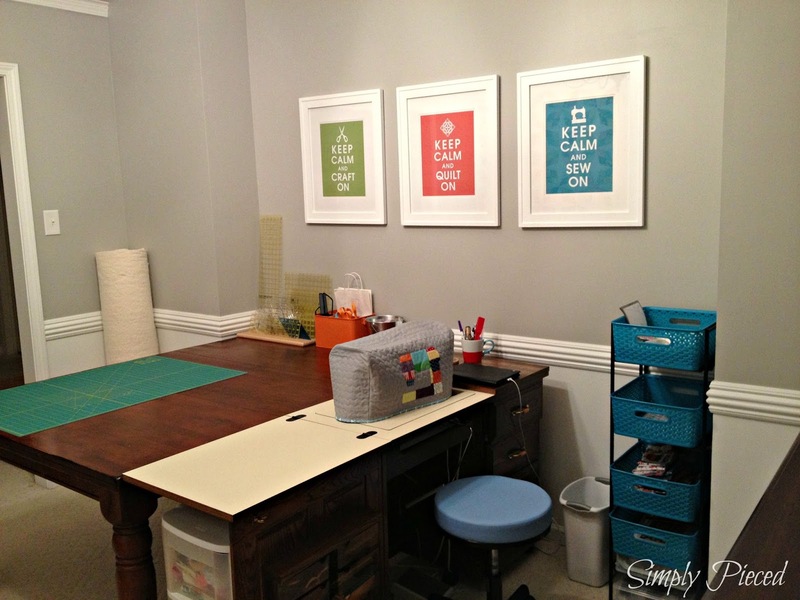 You created a great space for sewing and crafts. Just joined your site I am enjoying your blog.